Change to table view / Change to standard view – switches from list view to table view and back. Overview of retrieved segments – shows overview of all retrieved segments in table form. Overview will be displayed in a new window. Smart Coding Tool – opens the displayed retrieved segments in the Smart Coding Tool, where the assignments of codes can be customized. Code Relations Browser – opens the Code Relations Browser for the displayed retrieved segments, which visualizes overlapping codes. Word cloud – creates a word cloud of the words most often used in the displayed retrieved segments. Code retrieved segments – all coded segments that are currently in the “Retrieved Segments” can be coded additionally with an existing code. Code retrieved segments with a new code – all coded segments that are currently in the “Retrieved Segments” can be coded additionally with a new code. Print retrieved segments – prints segments along with indications of their origins. Open as Excel table – opens the retrieved segments in an Excel document. Open as HTML table – opens the retrieved segments in your standard browser. Export retrieved segments – the segments can be exported in text format RTF (text format), or as tables in XLS or HTML format. Memos attached to coded segments, other codes assigned to the segment, as well as tooltip variables, can be included in the exported material. Context search – allowing for searches within the retrieved segments. All coded segments in the activated documents that were coded with the activated codes are shown in the “Retrieved Segments” window. To the left of each of these segments is an info box with information about that segment. The info boxes tell you in which document group, document, and position the segment is found and which code was assigned to it. If you right-click in the gray area on the left side of the “Retrieved Segments” window (not on an info box), a context menu appears. This menu offers access to a number of different features that affect the way segments are received in this window. You can, for example, set how retrieved segments should be sorted or how activated codes are linked to each other. 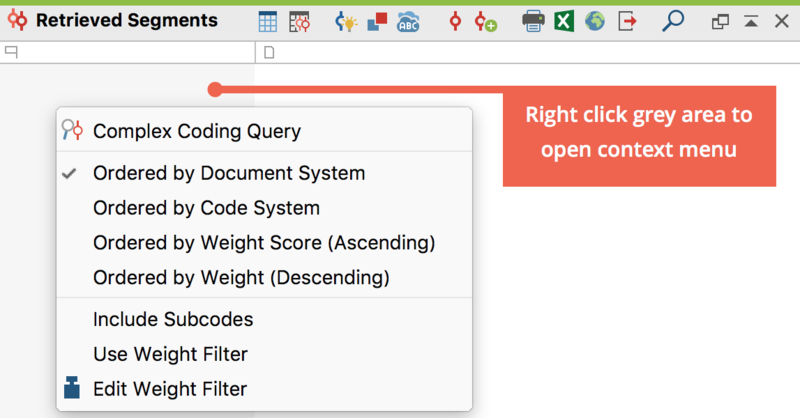 Complex Coding Query – opens the Complex Coding Query tool, which proposes numerous retrieval options. Ordered by Weight Score (ascending/descending) – sorts retrieved segments according to the weight assigned to them. Use Weight Filter – displays only those retrieved segments that are within a certain weight range. Edit Weight Filter – opens a window where you can change the range of weight scores included in the “Retrieved Segments” window. « Context Menus and Toolbar in the "Code System"